A leverage ratio is any kind of financial ratioFinancial Analysis Ratios GlossaryBelow is a glossary of terms and definitions for the most common financial analysis ratios terms. When calculating financial ratios using vertical and horizontal analysis, and ultimately the pyramid of ratios, it's important to have a solid understanding of important terms. that indicates the level of debt incurred by a business entity against several other accounts in its balance sheetBalance SheetThe balance sheet is one of the three fundamental financial statements. These statements are key to both financial modeling and accounting. The balance sheet displays the company’s total assets, and how these assets are financed, through either debt or equity. Assets = Liabilities + Equity, income statementIncome StatementThe Income Statement (or Statement of Profit and Loss) shows performance from operations of a business. The financial statement begins with revenues and, or cash flow statementCash Flow Statement​A Cash Flow Statement (officially called the Statement of Cash Flows) contains information on how much cash a company has generated and used during a given period. It contains 3 sections: cash from operations, cash from investing and cash from financing.. These ratios provide an indication of how the company’s assets and business operations are financed (using debt or equity). 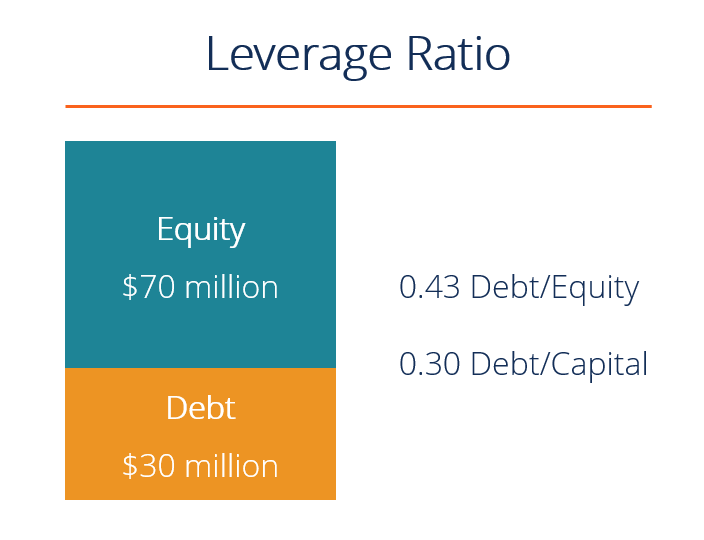 Below is an illustration of two common leverage ratios: debt/equity and debt/capital. There are several different leverage ratios that may be considered by market analysts, investors, or lenders. Some accounts that are considered to have significant comparability to debt are total assets, total equity, operating expenses and incomes. If a business has total assets worth $100 million, total debt of $45 million, and total equity of $55 million, then the proportionate amount of borrowed money against total assets is 0.45, or less than half of its total resources. When comparing debt to equity, the ratio for this firm is 0.82, meaning equity still makes up a majority of the firm’s assets. Leverage ratios represent the extent to which a business is utilizing borrowed money. It also evaluates company solvency and capital structure. Having high leverage in a firm’s capital structure can be risky, but it also provides benefits. The use of leverage is beneficial during times when the firm is earning profits, as they become amplified. On the other hand, a highly levered firm will have trouble if it experiences a decline in profitability and may be at a higher risk of default than an unlevered or less levered firm in the same situation. Finally, analyzing the existing level of debt is an important factor that creditors consider when a firm wishes to apply for further borrowing. Essentially, leverage adds risk but it also creates a reward if things go well. What are the various types of leverage? An operating leverage ratio refers to the percentage or ratio of fixed costs to variable costs. It shows the proportion of fixed assets (plant and equipmentPP&E (Property, Plant and Equipment)PP&E (Property, Plant, and Equipment) is one of the core non-current assets found on the balance sheet. PP&E is impacted by Capex, Depreciation and Acquisitions/Dispositions of fixed assets. These assets play a key part in the financial planning and analysis of a company’s operations and future expenditures) used by a company. A company that has high operating leverage bears a large proportion of fixed costs in its operations and is a capital intensive firm. Small changes in sales volume would result in a large change in earnings and return on investment. A negative scenario for this type of company could be when its high fixed costs are not covered by earnings because the market demand for the product decreases. An example of a capital-intensive business is an automobile manufacturing company. If the ratio of fixed costs to revenue is high (i.e. >50%) the company has significant operating leverage. If the ratio of fixed costs to revenue is low (i.e. <20%) the company has little operating leverage. A financial leverage ratio refers to the amount of obligation or debt a company has been or will be using to finance its business operations. Using borrowed funds, instead of equity funds, can really improve the company’s return on equity and earnings per share, provvided that the increase in earnings is greater than the interest paid on the loans. Excessive use of financing can lead to default and bankruptcy. See the most common financial leverage ratios outlined above. A combined leverage ratio refers to the combination of using operating leverage and financial leverage. For example, when viewing the balance sheet and income statement, operating leverage influences the upper half of the income statement through operating income while the lower half consists of financial leverage, wherein earnings per share to the stockholders can be assessed. A company takes on debt to purchase specific assets. This is referred to as “asset-backed lending” and is very common in real estate and purchases of fixed assets like property, plant, and equipmentPP&E (Property, Plant and Equipment)PP&E (Property, Plant, and Equipment) is one of the core non-current assets found on the balance sheet. PP&E is impacted by Capex, Depreciation and Acquisitions/Dispositions of fixed assets. These assets play a key part in the financial planning and analysis of a company’s operations and future expenditures (PP&E). A company borrows money based on the overall creditworthiness of the business. This is usually a type of “cash flow loan” and is generally only available to larger companies. When a company borrows money to finance an acquisition (learn more about the mergers and acquisitions processMergers Acquisitions M&A ProcessThis guide takes you through all the steps in the M&A process. Learn how mergers and acquisitions and deals are completed. In this guide, we'll outline the acquisition process from start to finish, the various types of acquirers (strategic vs. financial buys), the importance of synergies, and transaction costs). When a private equity firm (or other company) does a leveraged buyoutLeveraged Buyout (LBO)A leveraged buyout (LBO) is a transaction where a business is acquired using debt as the main source of consideration. An LBO transaction typically occur when a private equity (PE) firm borrows as much as they can from a variety of lenders (up to 70-80% of the purchase price) to achieve an internal rate return IRR >20% (LBO). When an individual deals with options, futures, margins or other financial instruments. When a person purchases a house and decides to borrow funds from a financial institution to cover a portion of the price. If the property is resold at a higher value, a gain is realized. Equity investors decide to borrow money to leverage their investment portfolio. A business increases their fixed costsFixed and Variable CostsFixed and variable costs are important in management accounting and financial analysis. Fixed costs do not change with increases/decreases in units of production volume, while variable costs are solely dependent on the volume of units of production. This guide teaches an analyst the fixed vs variable cost methods to leverage their operations. Fixed costs do not change the capital structure of the business, but they do increase operating leverage which will disproportionately increase/decrease profits relative to revenues. What are the risks of high operating leverage and high financial leverage? If leverage can multiply earnings, it can also multiply risk. Having both high operating and financial leverage ratios can be very risky for a business. A high operating leverage ratio illustrates that a company is generating few sales, yet has high costs or margins that need to be paid off. This may either result in a lower income target or insufficient operating income to cover other expenses and will result in negative earnings for the company. On the other hand, high financial leverage ratios occur when the return on investment (ROI) does not exceed the interest paid on loans. This will significantly decrease the company’s profitability and earnings per share. Beside the ratios mentioned above, we can also use the coverage ratiosCoverage RatioA Coverage Ratio is used to measure a company’s ability to pay its financial obligations. A higher ratio indicates a greater ability of the company to meet its financial obligations while a lower ratio indicates a lesser ability. Learn Interest Coverage, Debt Service, Cash Coverage, and Asset Coverage ratios, examples in conjunction with the leverage ratios to measure a company’s ability to pay its financial obligationsDebt CapacityDebt capacity refers to the total amount of debt a business can incur and repay according to the terms of the debt agreement. A business takes on debt for several reasons, boosting production or marketing, expanding capacity, or acquiring new businesses. How do lenders assess how much capacity for debt a company has?. 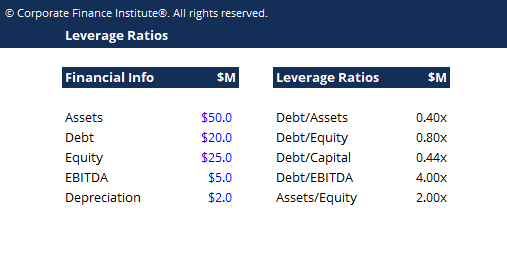 This leverage ratio guide has introduced the main ratios, Debt/Equity, Debt/Capital, Debt/EBITDA, etc. Below are additional relevant resources to help you advance your career.